ASA Roof Management Solutions - "Your roof is our reputation!" Allow focus of budget resources on specific problem areas. Allow instant, “up-to-the-minute” access to your specific portfolio. Provide proprietary information in a secure environment. Using RMS will allow you to quickly change from reactive, unplanned, costly repairs to predictive, budgeted maintenance. Alan Stevens Associates currently provides RMS administration on over 3,500 facilities throughout the country. Banks, universities, retail sites, office buildings and industrial sites take advantage of the powerful ability that RMS offers. These most-important assets that are managed through RMS and Alan Stevens Associates total over $400 million in value. You manage a portfolio of 125 facilities. You want to know how many facilities have roofs that are between 15 and 20 years old. You access your database of roof information; make a couple of clicks on your mouse and the list is produced. You then want to know which of those facilities have the worst leak problems and which are in the most deteriorated condition. Again, a couple of clicks on the mouse and your list is produced with budget figures for reroofing. Now you want to create a spreadsheet outlining the selections you have made in conjunction with your whole portfolio. A couple of mouse clicks and your report prints out. The reports can be printed out in multiple presentation formats – charts and graphs or plain spreadsheets. There are over 100 different information and report options available to you. Our professional staff does all data inputting and updating under the guidance and review of an assigned, client-specific consultant. All your information is proprietary and secure. All you do is access your information via our website at your convenience. The RMS database provides the most cost-effective and efficient way to manage your critical roof assets. At Alan Stevens Associates we have combined the power of technology with our professional consulting services giving you management advantages you never had before. ROOF MANAGEMENT SOLUTIONS (RMS) is an automated, Windows-based, management database system that combines the traditional functions of roof management activities into a powerful tracking and planning system. ROOF MANAGEMENT SOLUTIONS (RMS), combined with Alan Stevens Associates’ ability to analyze roofing problems and develop cost-effective solutions, helps clients create a system-wide facility control strategy at a level of integration and productivity impossible to achieve without automation. 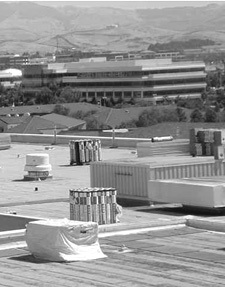 ALAN STEVENS ASSOCIATES is committed to the development and implementation of cost-effective, long-term, proven solutions for management of client facility roof assets. EFFECTIVE MANAGEMENT of facility roof assets involves the proper analysis of deficiencies and timely investments in appropriate maintenance and repair procedures. ALAN STEVENS ASSOCIATES’ evaluation, analysis, testing, design, project management, and construction quality assurance observation services provide our clients with the assurance that capital and maintenance budgets are properly invested to optimize life-cycle costs.